It was clear to me that it begins with "Harr" and that it ends with "son" and there was another letter between those pieces. So either "Harrison" or "Harreson". Both spellings were employed by Rev. 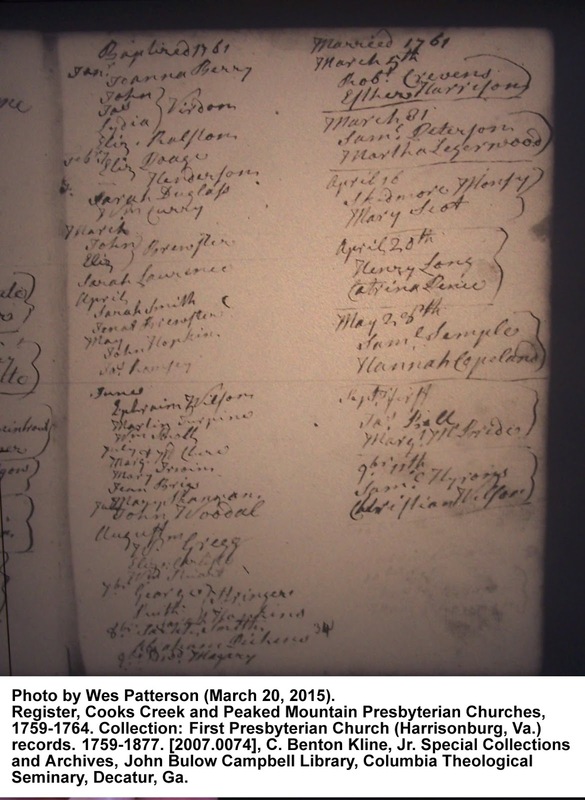 Alexander Miller at other times in this same ledger for other individuals. It clearly said "10br 24th" and "Thos. Peterson" and "Margt. Harrison" or "Margt. Harreson". 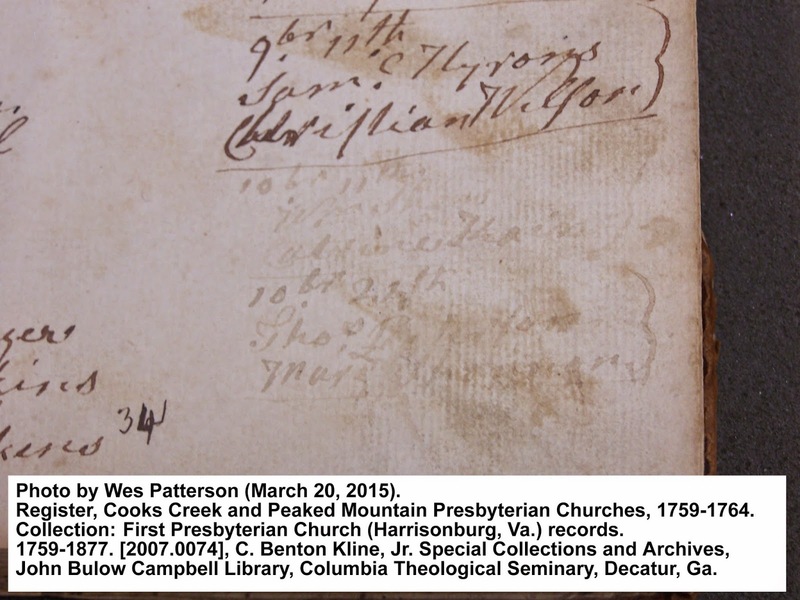 And by way of reminder, all Pattersons recorded by Miller were spelled "Peterson", just as all Cravens were spelled "Crevens". This means that John Patterson (m. Margaret Black) was the son of Thomas Patterson and Margaret Harrison, and that he descended from the Harrison family of Settlers by the Long Grey Trail fame. The big question is this... who was Margaret Harrison's father? It was most likely Samuel Harrison, son of Isaiah Harrison Sr. But there certainly seems to be a connection to the Thomas and Nathaniel Harrison of York Co SC, as more than likely, they were brothers of Margaret Harrison Patterson. At any rate, I just wanted to share the results of my trip to the archives today. If anyone has any questions, feel free to fire away. Thanks. After studying the digital images I took yesterday, I can now make out the handwriting better, particularly the middle part where I wasn't sure if it was an "i" or an "e".... What was throwing me off a bit turn out to actually be, in my interpretation, an "i" plus another "s" in the old style.... In other words, 9 letters total. Harrisson, with a double "s" not just one "s". So the loop I was seeing was not an "e" in the middle, but in fact an "i" plus the looped "s". 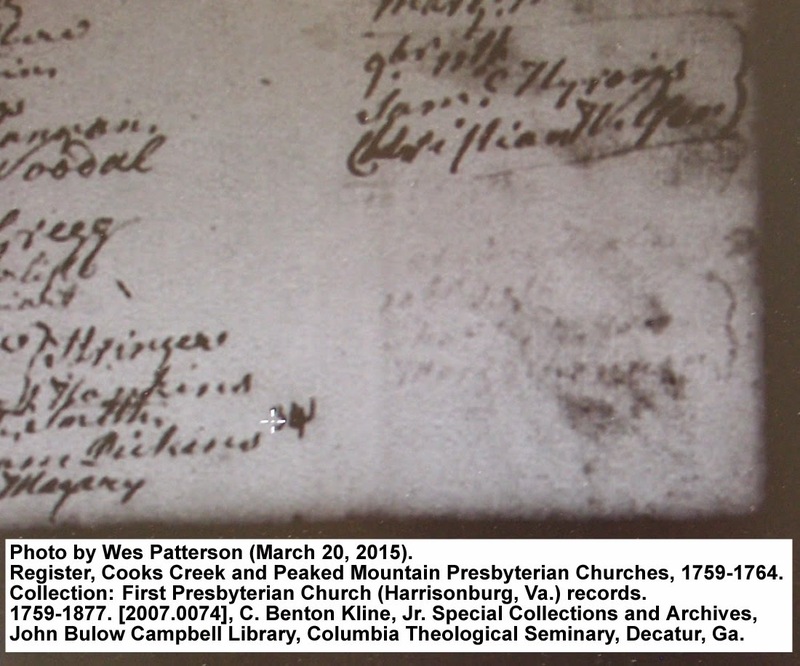 Here are four (4) images which compare the original book versus the microfilm version. You'll see how it shows up better on the original. Then the other image is closer up of the original version, but keep in mind, it showed up much better to the naked eye than this digital image shows. Nonetheless, this image is much better than what we've had in the past. I no longer lean toward the theory that Margaret Harrison, wife of Thomas Patterson, was the daughter of Joseph Harrison. That theory was mainly due to the extensive collaboration of the primary families (Harrison, Cravens, Patterson, Black, Ponder) who moved to Clarks Fork in York Co, SC in the 1760's, and their connections to the Joseph Harrison, Samuel Stewart, Jeremiah Harrison families, all of whom were involved in Joseph Harrison's estate vendue in 1748 in VA (Augusta Co., near Harrisonburg). 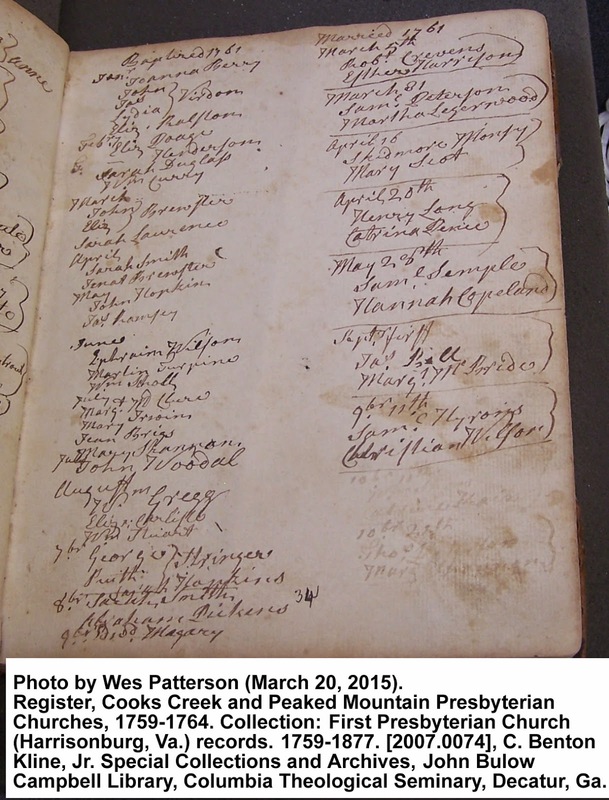 The connections of these families in DE and VA were there, but they diverged at that point. The Joseph Harrison and Samuel Stewart clans moved to the Yadkin Valley of NC about 1748, while other Harrisons (Samuel Harrison - brother of Joseph), and the Cravens, Pattersons, Blacks, and Ponders moved to York Co SC later in the 1750's and early 1760's. Samuel Harrison has never been identified in York Co SC, per se. He appears to have been found further south in the state, however. In recent months I have learned of another possible branch of the Isaiah Harrison clan which needs to be considered as a possibility for the branch my Margaret Harrison (Patterson) descends from. That would involve a third "John Harrison", a man who left Augusta Co., VA in 1765, and may have been a son of Old Gideon Harrison (1694-1729), son of Isaiah. That would make this latter John, a nephew to the afore-mentioned Joseph and Samuel Harrison. This last statement is assuming that Samuel Harrison was a son of Isaiah and his second wife Abigail Smith - as claimed by J. Houston Harrison in his book Settlers by the Long Grey Trail. While that may be true, I am not 100% convinced that Samuel was a son of Isaiah. It is possible he was a grandson of Isaiah by one of his daughters - say Elizabeth, perhaps. More research needed on this question. See http://rootdiggin.blogspot.com/2016/10/who-was-father-of-my-margaret-harrison.html for more details.